STEP 1. Ask the “leaders” of one, two or more student clubs to sponsor the presentation. WHY IS IT IMPORTANT TO REQUEST A SPEAKERS FEE? We donate the speakers fee to Earth First! Media projects. A small percentage also helps pay for our transportation to your school. Earth First! 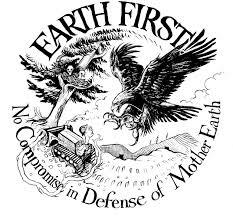 would not be able to do nearly as much to defend the earth if it weren’t for the funds we raise through the speakers fee. All students contribute to a student activity fee which is used to bring speakers, bands and other club activities to your school. The student government may have tens-of-thousands of dollars, even millions to distribute to student clubs. Schools generally provide anywhere from $500 to $3,000 for our presentations. In recent years, this has enabled us to expand Earth First! outreach efforts and produce media to support critical ecodefense campaigns, including fights against tar sands and fracking, coal mining, industrial logging, wolf hunts, and much more. our websites to assist in promoting the event. Thanks so much, we hope this check list is helpful. You may ask your classmates to take responsibility for two or three of these items so you aren’t over worked and to provide other students with an opportunity to participate in the success of the event. Call us at (561) 320-3840 or send an email to speakersbureau [at] earthfirstjournal.org if you have any questions. Thanks! For more tips and tools, check out Aid & Abet’s great resource section. We’ve also collected some good sources for reaching out to specific groups. The best strategy is to find one activist on a campus somewhere and start building up a series of events that way. Often the person who responds will know people in the surrounding schools too.